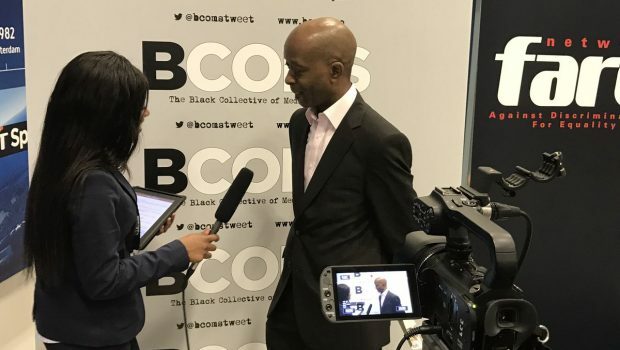 How hopeful can aspiring sports journalists from black and minority ethnic (BAME) backgrounds be about getting into the media industry and building successful careers? On the one hand, many of the delegates I met at DWord2 – the second conference on diversity organised by the Black Collective of Media in Sport (BCOMS) – spoke about opportunities and a widening of the industry’s ethnic and cultural mix. On the other, research shared by BCMOS founder Leon Mann painted a bleaker picture. 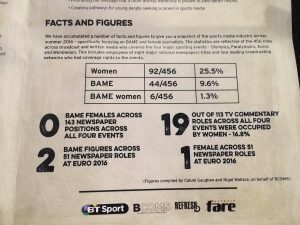 Among the 450-plus written and broadcast UK media personnel covering this year’s European Football Championship, Wimbledon, the Olympics and Paralympics, BAME representation was just 9.6%. There were no non-white females covering any of the events for newspapers, only two BAME males reporting for papers at Euro 2016 and one white female. 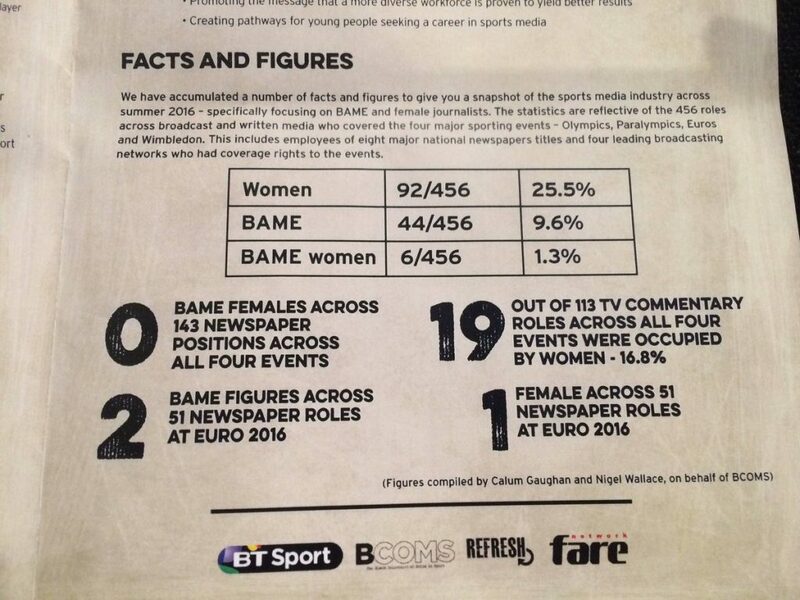 The figures for BAME and women reporters were boosted somewhat by 19 working in TV commentary roles across the four major events. 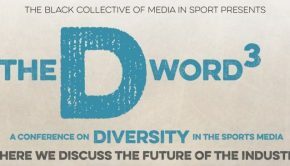 DWord2, held at the BT Sport studios in Stratford, brought together some of the most influential figures in the sports media industry to discuss its lack of diversity and underrepresentation. 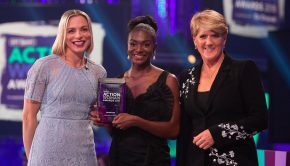 As a young BAME woman with ambitions to work in the sports media, I sense that there is progress being made. We are in a better position than before, but as the statistics showed, a lot of work still needs to be done. Whether it’s BBC executive Shelley Alexander, or freelance reporter and producer Benny Bonsu, a more truthful and accurate representation of our society in the media is a must. 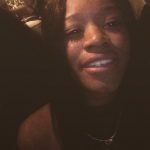 From a personal perspective, their success gives aspiring black female sports journalists like myself a glimmer of hope, that, regardless of our race or background – and so long as we are great at what we do, are determined and get guidance and support – we can one day turn our dreams into reality. Working at the DWord2 event gave me the chance to speak to Kadeem Simmonds, the UK’s first black sports editor of a national daily newspaper (The Morning Star), as well as Rodney Hinds, sports editor of Britain’s biggest and most recognisable black newspaper, The Voice. Both of these inspirational figures gave me a sense optimism. Although there’s still a long way to go, looking ahead, and with further backing and support from campaigning organisations such as BCOMS, we may come to find more journalists from BAME backgrounds in position of power and influence. I spoke to a number of journalists, as well as people who work in different areas of the media from the BBC to Uefa, many of whom said that they had not found it difficult getting into the jobs they currently do. Neither did they feel that they had missed out on opportunities because of their race or gender. I found their experiences uplifting. As the day continued, I took a step back and I realised that I was surrounded by black excellence, respected by their peers throughout the sports media industry. In the final year of my BA Sports Journalism degree course at the University Arts of London, they gave me belief that the journey I’m on can lead to a successful outcome. Young sports journalists like me, aiming to break into a traditionally white, male-dominated industry are doing so at the right time. This is because pioneers, like many of those attending DWord2, have blazed a trail for us and are actively working for fair and equal opportunities. Yes, the passionate debate on underrepresentation and the need for more diversity in the sports media stems from deeply embedded institutional problems. 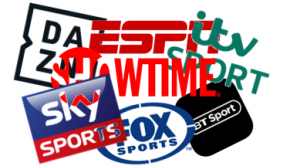 But the fact that the conference attracted so many of the industry’s big hitters, including Philip Bernie, head of TV Sport at the BBC, BT Sport chief Simon Green, and C4 commissioning executive Andy Stevenson, showed the issues are being taken seriously. I hope that, with a lot of hard work and dedication, I will one day be an inspiration for the aspiring young journalists from BAME backgrounds aiming to follow in my footsteps. For more on the work of the BCOMS, visit their website.